Lines work to keep plastic out of seas. Royal Caribbean will eliminate plastic straws next year. Royal Caribbean Cruises Ltd. (“RCL”) has announced that its fleet will eliminate plastic straws as of 2019. That applies to all 50 ships under the Royal Caribbean International, Celebrity Cruises, Azamara Club Cruises, TUI Cruises, and Pullmantur Cruceros brands. A “straws upon request” policy has already been in place across the RCL fleet. Beginning in 2019, guests requesting a straw will receive a paper straw rather than plastic. Additionally, the ships will incorporate Forrest Stewardship Council-certified wood coffee stirrers and bamboo garnish picks. All are part of RCL’s plastic reduction strategy. The company is engaged in a full plastics audit, with an overall plan set for completion by 2020. Additionally, Norwegian Cruise Line Holdings has joined Ocean Conservancy’s Trash Free Seas Alliance. The announcement comes in celebration of World Oceans Day. Norwegian Cruise Line Holdings Ltd. operates Norwegian Cruise Line, Oceania Cruises and Regent Seven Seas Cruises brands. Founded in 2012, the Trash Free Seas Alliance is a collaboration between leaders of industry, academia and the conservation world. Their focus is on the measurable reduction of ocean trash. ”Nothing connects people to the ocean more than time spent on the water, and with Norwegian Cruise Line Holdings offering that experience to more than 2.5 million guests each year, we believe this is a tremendous opportunity to foster greater stewardship of our oceans,” said Janis Searles Jones, chief executive officer at Ocean Conservancy. 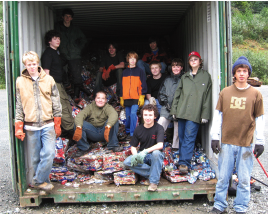 One line donates its crushed aluminum to the Boy Scouts in Juneau. 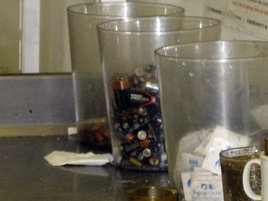 Cruise ships are some of the world’s most comprehensive recyclers. All waste materials aboard the ships are recycled, incinerated or offloaded and disposed of in approved shoreside facilities. Materials to be recycled are compacted, crushed or baled and stored on the ships until they are turned over to an approved vendor for disposal. One line donates its crushed aluminum to the Boy Scouts in Juneau, another offloads its used cooking oil for use as biofuel, and others donate used bedding to various non-profits. Materials to be recycled are compacted, crushed or baled and stored on board the ships until they are turned over to an approved vendor for disposal. In Vancouver, B.C., Tymac Launch Service has the contract to service the ships that homeport there for the summer. Tymac typically removes 42 tons of aluminum during a season, along with 261 tons of cardboard and 207 tons of scrap metal, and sends 22 loads of wood to the recyclers. Each week it hands over an average of six large boxes of printer and toner cartridges to the Vancouver Food Bank. The cartridges are sold to a recycler for a small fee.